Steven Lee Gilbert, 9780985336509, 284pp. A Lovely, Indecent Departure is the riveting and emotionally-charged debut from a promising new voice in literature, and a captivating story of a mother's love and desperation set amidst the heart wrenching landscape of child custody. Steven Lee Gilbert was born in Fort Wayne, Indiana but considers his childhood home the green, rolling foothills of East Tennessee and the southern Appalachia mountains, settlement to all sorts of interesting people, composites of which can be found throughout his writing. Most of his adulthood he's spent in the Sandhills and Piedmont of central North Carolina, where he lives now with his wife and family. Steven received his B.A. in English from the University of Tennessee in Knoxville, after which he was commissioned and served four years as an officer and paratrooper in the U.S. Army. While in school he had the pleasure of learning from Wilma Dykeman and in 2007 had the opportunity to work with Barry Hannah, both of which greatly influenced his writing. The next year, Steven was awarded a Durham Arts Council Emerging Artist Grant for Literature. He has also received recognition for his work as a writer from the Tennessee Writers Alliance. His work has been published in the Raleigh News & Observer, The Independent Weekly, Diabetes Health, and at Lifescripts.com. He is also the author of the blog, Without Envy. 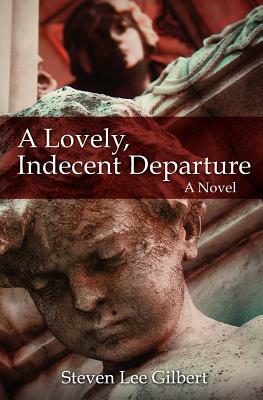 A Lovely, Indecent Departure is his first novel. You can read more about him at www.stevenleegilbert.com.